As more and more GN decanter centrifuges are using in the oil and gas industries for the drilling fluids management and water recycling, GN decanter centrifuges are helping more and more clients to protecting the environment. Now GN Solids Control is manufacturing about 250 sets to 300 sets every year, most of these decanter centrifuges are using over abroad. In order to fulfill customers’ demands, GN usually sends out our engineers for the after sales service. 1. The wire connections need to be fully correct. Any wrong connections may lead to the damage of decanter centrifuge, and the separation work can not be reached. 2. The liquid discharge port should not be changed without allowance. For uncertain situations, we recommend to place a catching tank in the bottom of the liquid discharge port. Once the pipe connected with liquid discharge port is too small, fluids will be flooded from the small end and the VFD control panel will give a stop signal to the main motor for protection. 3. The initial feeding capacity should be too large. Although GN decanter centrifuge can deal with 130 GPM, different OBM or WBM has different density so the treating capacity is not always the same. For the clients have no idea about the feeding capacity, we recommend to give a relative small feeding capacity at first. If the solids discharged from the solids port is pretty dry, the feeding capacity can be increased. On the other side, if the solids with too much oil or water after being treating by decanter centrifuge, the operator should decrease the feeding capacity a little bit. 4. Clean the decanter centrifuge thoroughly after you finish the separation work every day. Keeping feeding some clean water into the centrifuge, some solids left in the collection box will be cleaned. And after the cleaning, spin the centrifuge manually to let the inside water come out. 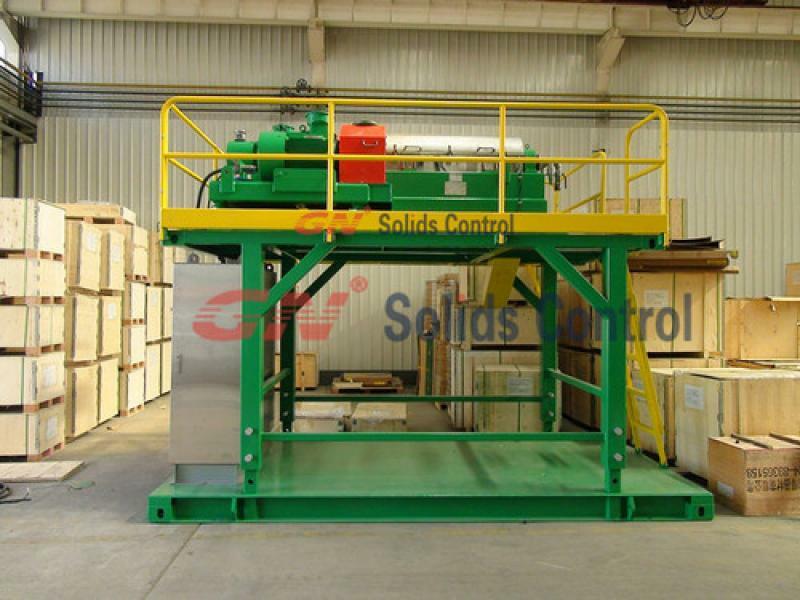 GN Solids Control has been working on designing and manufacturing decanter centrifuge for many years. Now there are about 250 to 300 sets decanter centrifuges are provided by GN to over 60 countries. GN has upgraded their decanter centrifuges to the third version; all the modifications and upgrade are all made carefully by the experiences gained in the worksite. GN technicians are devoted to give the best solutions for worldwide clients. Until now, GN is the first Chinese manufacture that can provide decanter centrifuge and cuttings dryer together. With many years and thousands successful projects, GN are providing the more and more perfect solids control equipments (shale shaker, mud cleaner, decanter centrifuge, cuttings dryer etc). In order to use GN decanter centrifuge well, today we would like to share you some info on how to operate it. Before testing running, the operators need to disassemble the fix belts and supporting brackets on the bowl. All the belts and brackets are used for safety transporting. GN provide stand to support the whole decanter centrifuge in a proper height. Operators need to find a good locate the decanter centrifuge with stand. All the wires that connected to the VFD control cabinet is using air plug, and the four inside ports are used for connecting the power lines and ground line with the VFD control cabinet. Make sure to put the four ports in a right direction first. After read the decanter centrifuge carefully, you can run it according to the instruction. Check the rotating direction of the two motors, and make sure they are running the same direction as the red arrow showed on the case of the motors. For the second version decanter centrifuge, you need to flush the rotating bowl and propeller some time after finishing the separation every day. Generally speaking, most of the decanter centrifuge broke down are caused by solids blocked in the bowl. Lubricate the necessary parts as the instruction says. A good maintenance can help to expand the life span. Whenever you have problems, feel free to contact with GN immediately. As the fast development of GN Solids Control, GN has provided many sets of solids control systems to clients from various industries. Recently, GN got many inquiries on waste water management, some clients need to separate the clean water from drilling mud can d reused the water. Although different projects are customized by different working situations, the working principle is pretty the same. 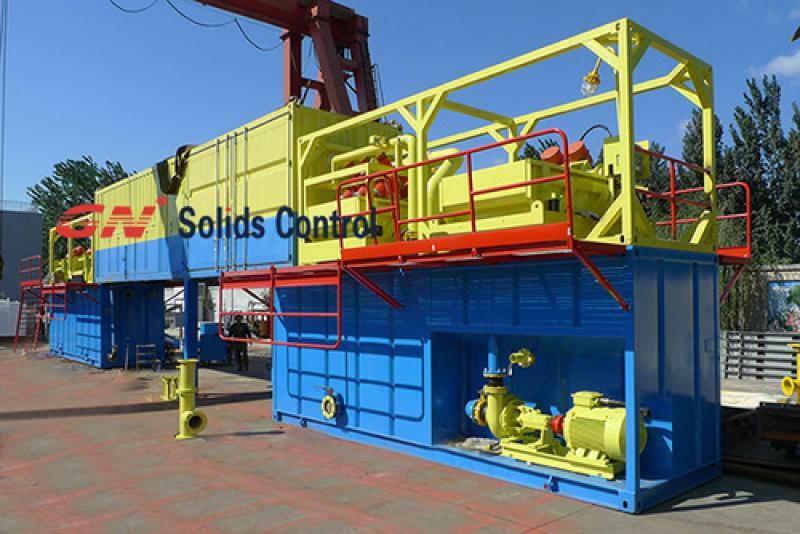 Just take one of the dewatering unit that GN Solids Control provide several months before as an example. It’s used to separate solids that larger than 100 microns. Here we use GNZS706E-HB. Desander is one type of shale shaker with large cylones, which can be used to separate solids larger than 50 microns. Sometimes, GN recommend to use desilter which is equipped with small cylones and can do much finer separation. The flocculation is used to add polymers into drilling fluids which can help to collect small diameter solids. The drilling fluids come from flocculation tank can be further separated by GN decanter centrifuge, which can separate the solids larger than 2 microns. So after all the treatment by the above solids control equipments, clean water can be separated from drilling fluids or waste water and this clean water can be reused. For some strict demands, such as the discharged mud need to be pretty dry, GN Solids Control recommend to use vertical cuttings dryer. By using GN vertical cuttings dryer, clients can deal with oil base mud (OBM), water base mud (WBM) and synthetic water based mud (SBM). GN has provided many sets of cutting dryer for mud separation. Based on the working performance, the oil can be separated to below 5% and the water can be separate to below 10%. For details, welcome to contact thomas@gnsolidcontrol.com. 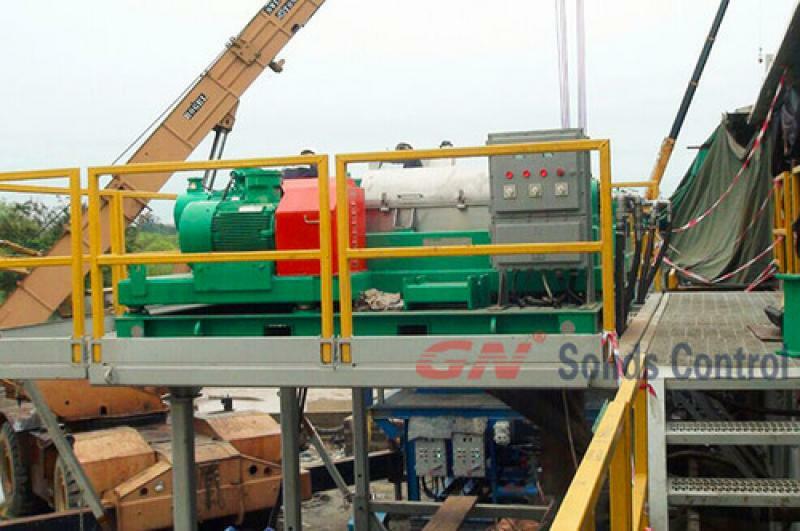 GN Solids Control Co. has been working on solids control and drilling waste management systems for many years, there are clients from over 60 countries are using GN products. With the fast development, GN moved to the new factory near Beijing several years ago, and GN has been building another factory which is quite near the current factory. Last year, GN has established two branch companies in America and Russia, GN is working on the storage of solids control equipments and spare parts in these two branch companies. Right now, GN Solids America has 4 shale shakers, 2 mud cleaners, 2 decanter centrifuges in Houston warehouse, some other spare parts are also kept here. As GN decanter centrifuge is quite popular, we have sold about 250 sets every year. Today we would like to give you some brief introduction on how to choose GN decanter centrifuge based on the rotating speed. The rotating speed as well as differential speed is quite important for the performance of decanter centrifuge. The largest rotating speed is not always the best solution. 1. For barite recovery, you can use GNLW452 at the rotating speed of 1800 RPM, while for GNLW363 you can use 2200 RPM fix speed. 2. For high gravity solids separation, we recommend to use GNLW452 or GNLW363 at the rotating speed of 2700 RPM. If equipped with cuttings dryer, you can use GNLW363 with 2700 RPM pulley. 3. For low gravity solids, we recommend to use GNLW363 equipped with the 3200 RPM pulley. 4. For solids control system, one set of GNLW452 and one set of GNLW363 is totally OK, the rotating speed can be 2700 RPM or 3200RPM. 5. It’s obvious that you can choose variable speed decanter centrifuge if you are not very clear about the solids condition. And you can change the rotating speed quite conveniently when the solids condition is changing at the same time.